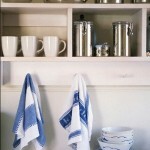 Many homeowners thinking about resale choose to use neutral colors in their cabinetry design. Kitchen and bath decorating then becomes a matter of assembling ideas for designing surrounding areas of white cabinets with accent colors. This can be done with tea pots, pictures, hand towels, toaster ovens, plants, flower and many other items that have contrasting hues. I always believe that less is best for many different reasons. Having neutral colored cabinets and countertops, carefully accented with elegant contrasts, will produce an attractive look. Our photo selection clearly demonstrates this point when you compare the less cluttered designs with the ones that have a lot of distracting colors. By adding glass doors to your designs and placing your colored accented china plates, bowls and cups in them, your kitchen will look organized. Keeping the accents in groups will grab the viewer’s attention. Large supply centers such as Bed Bath & Beyond or the Pottery Barn have loads of ceramic china pots, bowls and cups that can be used sparingly for adding a dash of color to your white kitchen cabinetry design. 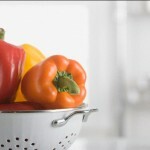 Taking time to find attractive dish towels will greatly enhance the appearance of the neutral colored kitchen cupboards. You may want to consider having some that are for display purposes only, especially if you have children. 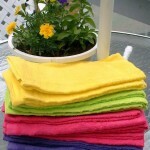 Invest in some expensive ones that only get brought out when guests are coming over and have some less costly colorful dish towels for everyday use. 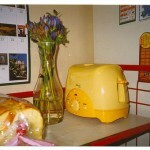 Keeping fresh flower arrangements in the kitchen is not recommended because of the continued expense. It does make sense to plan on having them displayed when company is coming over for dinner. 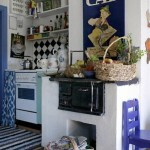 A glass vase with colorful flowers makes for an attractive accent when decorating a kitchen that has white cabinets. Along the same line, colorful pots with plants can be very appealing to the eye and less costly than purchasing fresh flowers. Toasters, coffee pots, mixers, blenders and toaster ovens are available in various colors. Although you may have to spend a little extra money, the benefits of splashing a little brightness through colored appliances can be very rewarding. 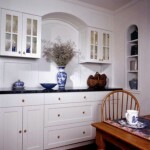 White kitchen cabinets are a great choice for the homeowner who has resale-value in mind. 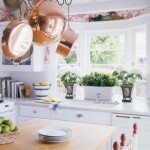 A neutral colored kitchen design can become very attractive when creative decorating ideas become reality. Just remember to keep the accents to a minimum and avoid adding too much clutter. Keep it simple and clean with a splash of brilliance in confined spaces and the final look of your cupboards will be stunning. 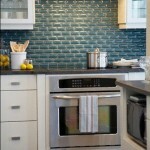 You have some excellent ideas for kitchens. That has been one of the recurring themes in my own life–looking for a way to make our bathrooms and our kitchen look really glorious, even though those rooms are much too small. One of the glories of the Internet, though, is that there is absolutely no dearth of ideas. Right now I have no idea of what I will ultimately do, but I keep hoping I will come up with something really slick. 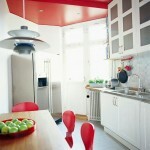 I love the red ceiling in that kitchen – it looks beautiful and it’s so unexpected. Yes, I agree totally. The red ceiling really adds a lot to the overall design of the kitchen. Bright colors like this are difficult to design with. It takes a really good designer to accomplish excellence using them.